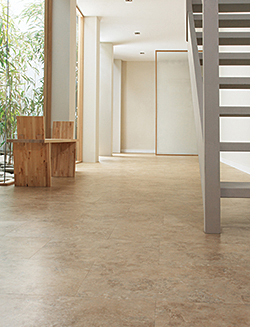 Travertine by Spacia is low-VOC, FloorScore certified and has backing made of 100 percent recycled material, a ceramic finish and a urethane coating. The tile is available in five patterns. Sizes include 12-by-12-inch, 12-by 18-inch and 18-by-18-inch.